Hostal Campobello, Bogota, Kolumbia : Rezerwuj teraz! 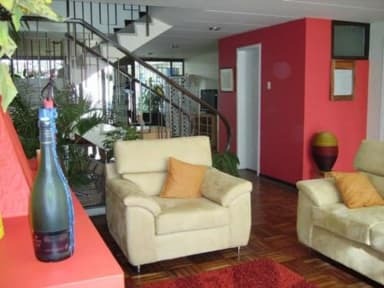 Campobello-Bogota is a quiet and very comfortable B&B located in the safe northern part of Bogota. It has a garden with barbeque, a terrace and hammocks where you can enjoy your stay here. You will be surprised at the sound of birdsong in the morning because we are situated close to one of the many parks in the area. Ours comfortable rooms have their own bathrooms. Our excellent service make for a very pleasant stay. The B&B is near la Zona Rosa with its restaurants, bars and boutiques. The Pasadena district is home to small and typical boutiques, restaurants, patisseries, barbers, hairdressers, tailors, money echanges and travel agencies are all within walking distance, should you want to avoid the large, popular supermarkets that are also in the vicinity. The close 'Transmilenio' Bus station 106, is very convenient to reach the most important tourist sites and to get to small, pleasant towns like Suesca, Cajic, Guatavita, Villa de Leyva, and Zipaquira's Cathedral of Salt. If you wanto to go to the theatre, Teatro La Castellana is near here. Somme embassies such Switzerland, England, France, Russia and Mexico are relatively near the B&B Campobello and the Universidad Nacional the most important of the country, too. Prices include: breakfast, linen and towels, safe box, luggage storage, books.